Omron NE-C801 CompAIR Compressor Nebulizer offers an affordable and efficient alternative for patients experiencing Asthma, COPD or other Respiratory Conditions. The compact design of the Omron CompAir gives patients the ability to take the product wherever life takes them. Its unique nebulizer design delivers powerful performance and shortened treatment times. 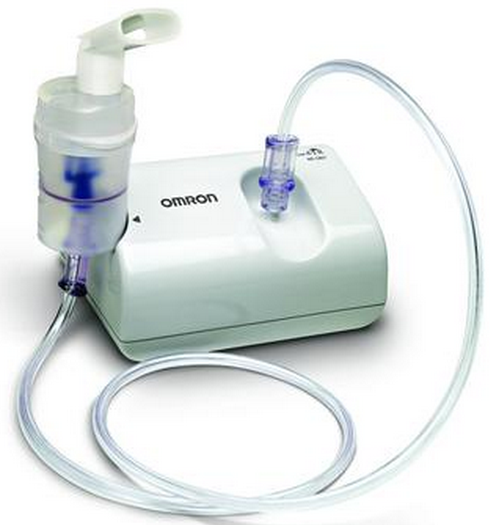 This Omron Nebulizer is 3½ times smaller than most Compressor Nebulizers which helps minimize storage issues. Also the Omron Nebulizer System is 75% lighter than most Nebulizer Compressors at less than 10 ounce for easy portability. Simple to operate with one-button operation that provides fast and effective medication treatment. Durable design that is built to last with a 3 year warranty. The Omron CompAIR was developed for the successful treatment of asthma, allergies and other respiratory disorders. The compressor forces air to the nebulizer. When the air enters the nebulizer, it converts the prescribed medication into an aerosol of microscopic droplets that can easily be inhaled. Small size for easy storage. One button operation for simplicity. This item uses 100 watts per cycle. Where is it made please? Omron has several manufacturing plants in the U.S.; however they are headquartered in Japan. This product uses an AC charger for usage. The manufacturer does not list a battery unit. For reference, we've updated the product page with a manual. Does this unit require saline solution or water? The manufacturer states "Do not use tap or mineral water in the nebulizer for inhaling purposes." Therefore it is best to use saline. Does this nubelizer run on electric and battery? Do I need a prescription from a doctor to order a nebulizer? Hello Jeff: This item does NOT require a prescription. I hated the noise of my first nebulizer, and after a while replaced it with one slightly quieter. However, the Omron is much quieter. They specify 37.9 dBA, which is too low to measure with my decibel meter. After using it for a week, I still love it. My wife doesn't have to leave the room, and I don't have to use my noise-canceling earphones. I have only used the compressor 1 time so far appears to work great. light weight. Easy to use. Shipping was fast, no problems there. The description of this compressor says it's quiet for a reason. This is not a heavy duty compressor like I'm used to. I tried to use other nebulizers with it and it isn't powerful enough to "nebulize" the solution. If you need to replace it, you can't just grab one from a medical supply nearby. You have to keep ordering from this company. Normally one vial takes ten minutes to nebulize with my old compressor. This one takes twenty to twenty five minutes. I'm extremely satisfied with this light-weight, easy-to-use nebulizer and recommend it highly. Quit working after a few months. Excellent unit for easy, efficient portability!